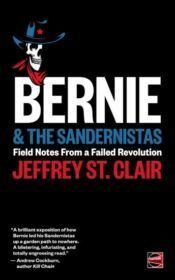 Please go to the Counterpunch website to see more of Jeffrey St Clair articles. Link can be found below. This article gives very clear insight to accusations made regarding HRC loss at the November elections. Australian comment is clear evidence that our commentators haven’t the capacity for clear thought and mimic the establishment wishes to blindly ‘follow the leader’ along government lines. The Russian Game is a chess strategy developed in the mid-19th Century by Alexander Petrov, a grand master from St. Petersburg. Petrov’s thinking about chess was deeply influenced by Napoleon’s invasion of Russia. Essentially, Petrov viewed chess as a kind of military exercise and his Russian Game was a defensive plan to protect the “homeland” of the chessboard from attack by an overwhelming imperial force through deception, misdirection and infiltration. Has Vladimir Putin deployed a Petrov Defense operation against the American electoral system? Has he mirrored decades of CIA and State Department-sponsored meddling in elections in eastern Europe, Africa, the Middle East and Latin America by unleashing a cyber-hack on the Democratic National Committee? Did the Russians hack the voting machines themselves, the way American operations once stuffed ballot boxes? Or is it all one big psy-op, an elaborate con out of a LeCarré novel, meant to make the American political and intelligence establishment re-enact the self-consumming witch-hunts of the McCarthy era? In other words, what if the real Russian plot was to plant the idea that Russia had hacked the vote? Thereby sending panic through the nation, launching investigations that devolve into wild goose chases, pitting intelligence agencies against each other. Frankly, I have no idea whether Russia influenced the US elections, though both nations have been meddling in each other’s business since at least the Russian Revolution. But it’s quite clear that both the CIA are FBI are meddling in the election, which should be a much more troubling reality for Americans. The CIA, in particular, is prohibited by statute from any kind of domestic operations, a ban which Obama’s executive order seems to violate. +Isn’t it in the financial and budgetary interest of “cyber-security firms” and intelligence agencies to allege massive hacking, when many cyber experts without a financial or political stake in the game say that “leaking” of DNC emails is much more likely scenario? + Did the alleged Russian hacks of DNC emails really sway the election? Very doubtful, since the Wikileaked e-mails were largely, to use Joan Didion’s phrase “inside baseball,” and the content only confirmed what most thought of HRC to begin with: she was a duplicitous politician who was willing to carry water for Wall Street. How many “undecided voters” actually read Hillary’s tedious Goldman Sachs speeches? Most knew that she gave them and got richly rewarded for them, which is enough to draw the right conclusions. But consider the case of Kurt Eichenwald, a “senior reporter” for Newsweek who clearly wanted Hilary to win and for his exposés to take down Trump. Several of Eichenwald’s big pieces for Newsweek quoted–anonymously in many cases–foreign officials and business executives about Trump’s financial dealings and entanglements overseas. These foreign officials clearly spoke to Eichenwald because they wanted Trump to lose. Couldn’t it be argued that Eichenwald himself, then, serve as a conduit for foreign meddling in US elections? When it comes to assessing the true extent of Russian “influence” in Trump’s win wouldn’t you first have to subtract the Israeli influence exerted by Sheldon Adelson ($25 million), Benjamin Netanyahu and the Israeli government? Will there be hearings? After revelations that the DNC sabotaged Bernie Sanders, Democrats, who now quaver about the integrity of the democratic process, didn’t call fora “recount,” “revote” or for convention delegates to be freed to vote their conscience–those who had a conscience. + Just as the steam was beginning to run out of the 9/11 “Truth” movement–the totalizing theory to justify the impotence of the Left during Bush time–the Russian Truther movement is born to explain HRC’s loss and every horrible thing that will happen for the next 4 to 8 years. The big difference: this one has gone mainstream faster than the CIA killed JFK conspiracy. Paul Krugman delivers right on cue…. + Looks like Trump just claimed another head for his wall in the Map Room of the White House to go along with the Bushes and Clintons: Bill Kristol, the man who was never right about anything, is stepping down as editor of the Weekly Standard. + Glenn Thrush, one of the “journalists” who submitted drafts of his stories to Clinton campaign to preview and approve, will now enter New York Times stable, grazing along side Maggie Haberman, one of the stenographers for Clinton campaign who was notorious for “teeing-up” stories for HRC. + Meanwhile, back in the Asylum of Big Time Journalism, Newsweek’s Kurt Eichenwald, who claims someone induced him into an epileptic seizure by sending him a strobing light message, claimed this morning on “Good Morning America” that his previous tweets about Trump being confined to a mental hospital were “part of series of jokes & intended to be ‘signal to a source ‘s talk w/him.” What’s the frequency, Kenneth, I mean, Kurt? + Civil libertarian John Whitehead has written an evocative piece on how the goody-two-shoes Jesus would have fared under the current American police state, though I much prefer the petulant, moody, needy and greedy, ego-maniacal and deeply-flawed god of the Old Testament, who might have wiped them all out had they pulled a no-knock raid on one of his love shacks…. + Joe Biden sought to reassure anxious Sierra Club types this week by saying that “Trump will not be able to undo too much of Obama’s environmental legacy.” True enough, mainly because there’s not that much of substance to undo. + In a moment of pious reflection, Obama said earlier this week that throughout his presidency he has considered the effects each of his actions has on children. Is that before or after he drones their parents and siblings? + Amid his unwavering devotion to bettering the lives of children, it may be churlish to ask how many nights the President lay awake thinking of those kids sleeping on the sidewalk under a pile of dirty blankets a few blocks away from the White House trying to stay dry in a cold autumn rain. The homeless crisis, a crisis he never mentions, has only gotten worse during his presidency. According to Richard Schweid’s important new book, Invisible Nation: Homeless Families in America, in 2002 there were 1 million homeless children in America. By 2006 there were 1.6 million homeless children and by 2014 the number had risen to 2.5 million children. 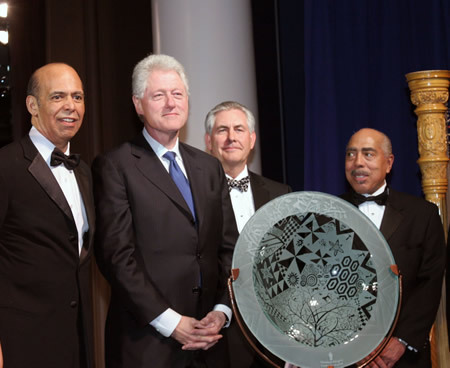 + Exxon’s Rex Tillerson was no stranger to the Clintons. They wanted his money…for the Foundation, naturally. According to the leaked DNC emails, they also considered Tillerson an enlightened CEO, a man you could do business with. In fact, Tillerson spoke at a Clinton Global Initiative forum on the education of women. Here’s a photo of Bill standing side-by-side wit the notorious Russian agent. Who will break the news to Rachel Maddow? + Condi Rice also says Exxon’s Rex Tillerson is “great choice” for Sec. of State. Of course, this praise comes from a woman who had an oil tanker named after her. + Two weeks ago word leaked out of Trump Tower that Donald was set to tap Rep. Kathy McMorris Rodgers, the congresswoman from eastern Washington, as his pick for Interior Secretary. But Rodgers’ nomination was scuttled a few days later, apparently through the intervention of Trump’s son Mini-Donald, in favor of the bombastic Montana congressman Ryan Zinke, a former member of Navy SEAL Team 6. There’s a backstory to this that involves two outfits that represent the interests of big time hunters, many of them corporate executives and Wall Street hotshots: the Montana Elk Foundation and Back Country Hunters and Anglers. The heads of both of these organizations have recently bragged to the Montana press of having pressed Trump to name Zinke over Rodgers. But why would either of these groups from the distant interior west have any influence over Trump? That’s where Mini-Donald steps into the equation. It turns out that Mini-Donald, often referred to in the mainstream press as an “avid outdoorsman,” is a lifetime member of Back Country Hunters and Anglers and hunting pal of its director Land Tawney, a man who felt that it was his duty to shoot a sage grouse soon after the Interior Department buckled to pressure from ranchers, oil companies and hunters and decided not to list this imperiled birds as an endangered species. 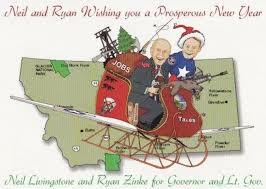 As for Zinke, his Christmas card from a few years ago gives much insight into his character and psyche. It depicts him dressed in a Captain America jumpsuit, holding an M-16 rifle, riding in a jet-powered sleigh with fighter plane wings featuring a decal of Osama bin Laden’s x-ed out face. The bag of presents is stuffed with an oil derrick, chainsaw, and miner’s pick axe. The front of the sleigh is draped with the carcass of a dead grizzly. Let’s dispense with the “avid outdoorsman” nonsense and call Mini-Donald what he is: a depraved trophy hunter. So one depraved hunter picks another depraved hunter to head the Interior Dept. This is the kind of experience that will prove invaluable for Zinke in his new gig overseeing oil and coal leases. A plump resumé of fraud is a prerequisite to lead the Interior Department. + Obama: still 252 pardons behind his hero Reagan. Leonard Peltier, Chelsea Manning, Edward Snowden and Oscar López Rivera wait and wait and wait. + Apparently, Trump’s team is so desperate to find homegrown talent to perform at his inauguration that he has offered ambassadorships to agents and producers who are willing to sign up their clients to sing at the inaugural galas. Perhaps Mel Brooks could be bribed into slapping together an inaugural production of “The Producers” in exchange for the ambassadorship to Austria…? + Instead of the reading of a poem, the Trump inauguration team is leaning toward a performance by Andrew Dice Clay. + Allen West will never get that Undersecretary of Defense slot he craved now that he has deleted and denied responsibility for a Facebook posting calling for the “extermination of Muslims.” Trump needs a few good men with real backbone, who won’t retreat from their positions when the going gets a little rough. + Trump’s cabinet must come as quite the blow to K Street. Who needs to go to the expense of hiring a lobbyist anymore? + South Carolina Lindsay Graham, one of the most petulant and paranoid members of congress, announced to little fanfare that his fly-by-night campaign emails had also been hacked by “the Russians.” No doubt this was when Graham’s poll numbers had briefly doubled, from 0.25 to 0.50%, and Putin needed to act swiftly to snuff out the Graham surge! + Retail pot sales are doubling every six months in Oregon, Washington and California. Marijuana sales during Trump time will soar higher than AK-47 sales under Obama. + In 2001 Portugal became the first European nation to decriminalize drugs. Portugal now has 4.5 drug deaths per million residents, while Europe at large sees 19.2 drug deaths per million people. + If a combination of Russian hacking and homegrown misogyny defeated HRC, what defeated Russ Feingold and Katie McGinty? + Remember when being a billionaire was something to write home about? Now, all you get for a measly $1.8 billion is a sub-cabinet post like Secretary of the Army…. + Temperatures at the North Pole this Christmas week may well reach 55 degrees higher than normal. 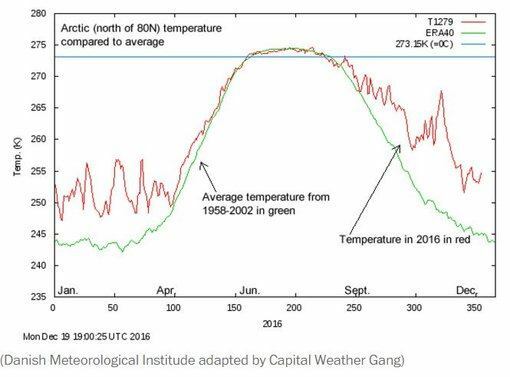 On this chart, the green line represents the average Arctic temperature from 1958 to 2002, while the red line represents this year’s temperatures in the nearly ice-free Arctic. Over to you, Rex Tillerson. Oh, poor, poor, Lena, she couldn’t have her own abortion, sniff, sniff, but she tried desperately to get Hillary elected so that she could perform retroactive abortions in her name via drone on Iraqi, Pakistani, Afghan, Syrian and Libyan kids. Then she’d have really had something to brag about…Alas. + There’s an intriguing new site on the web called MormonWikiLeaks, where people can anonymously upload documents regarding the inner-workings of the Church of Latter Day Saints. It’s not yet clear whether MormonWikileaks is a Subsidiary of Vlad the Nosy Bear Enterprises. + For four decades, the federal government has concealed shocking data on birth defects in children whose parents were exposed to Agent Orange during the Vietnam War. This research was finally exposed this week in important stories by Pro Publica and the Virginia Pilot. The data found that the odds of having a child born with birth defects during or after the war were three-times higher for veteran who were exposed to Agent Orange than those who hadn’t been. + So much for the vaunted Obama recovery. A report by economists Lawrence Katz of Harvard University and Alan Krueger at Princeton University shows that nearly 95% of all new jobs created during the Obama era were either part-time or contract labor, largely in the low-paid service sector. Indeed, the number of people toiling in these thankless temporary jobs swelled under Obama from 10.7% of the US population to 15.8%. You want some fries with that? + I’ve spent the last couple of weeks collating and organizing the first half of Native activist and poet John Trudell’s FBI file: 6,320 documents, 22,137 pages, dating only until 1980. Top that, if you dare! A guy told the tale of how he was an editor for an underground High School paper in Utah in 1969. And one day, the FBI came knocking. The FBI guy got furious and thrust the paper in the guy’s and there he sat looking at Moose and Squirrel. “See. Right here. Fidel!,” he screamed, pointing to the Zig Zag man. Come to find out, they had two agents assigned full-time to ferreting out Castro’s funding of student underground papers! + The search for a scapegoat goes on in Clintonworld. This week Bill blamed Hillary’s defeat on Trump’s ability to “get angry white men to vote for him.” Not so fast, Bubba. Trump won 63% of the white male vote, almost exactly the same percentage as Reagan (63%) and Romney (62%). And white males comprise a smaller share of the electorate than they did in Reagan time. Trump held the line with the Republican base, Hillary failed to get hers to turnout–mainly by turning them off. + Trump’s plan to fight global warming: nuclear winter. + John “I am the Walrus” Bolton, still in the running for some kind of gig in Trumpland, said this week that the DNC email hacks might not have been instigated by Putin after all, but could have been a false-flag operation directed by…yes…Obama. Why? Because that’s just the kind of devious thing the America-hating Kenyan imposter might do. Goo goo ga joob. + NPR’s talk show host Diane Rehm is finally unplugging her microphone. Her retirement has, naturally, elicited torrents of babble about the “end of civil discourse” in American politics. Nonsense. Why should political discourse be “civil”? It was far from civil in the origins of the Republic. I used to call her show Radio Narcolepsy. Rehm tried to make tedium a virtue. + Many of Clinton’s most ardent supporters now seem convinced based statistical analysis by the fully (but not fully enough, apparently) discredited stat-boy Nate Silver that FBI director James Comey’s letter to Congress announcing the re-opening of the investigation into her email server cost HRC the election. Was it a Russian forgery? + If the Russians did hack the election for Trump, the Democrats should respond by putting a new spin on the Asian Pivot and begin cozying up to the Chinese to hack it back for them in 2020. + How rotted out is the Democratic Party at an institutional level? In California, Clinton won 6 congressional districts held by Republican members of Congress–the Democrats took back NONE of those seats. There were no coatstails to those pantsuits. + Americans have been rightly conditioned to disbelieve almost everything politicians tell them, so it sticks like Velcro when they hear a candidate speak candidly. Who really bought anything Trump was selling? Hillary, however, was undone by two occasions when she was caught telling the truth, or if not the “truth,” at least what she truly believes: first, when she called half of Trump’s supporters a “basket full of deplorables” and second, and more fatally, I think, when she was outed telling her friends on Wall Street that she has a “public” and a “private” position. + The Democrats are convinced that the exposure of what their leaders really think cost them the election. So what changes are they likely to make? a) change their leaders; b) change what their leaders think; c) lie better; d) hire a new cybersecurity firm.